Termites and carpenters ants are threats that we do not often think about until it is too late. Homeowners often neglect to check for these devastating pests during the summer months when they are most active and swarming. One of the main places that these pests nest in is a house’s garage. Garages attract carpenter ants and termites because they have wood frames and areas of the wall that are not sealed properly and can provide easy entry. Garages also have higher levels of moisture than other parts of the house which attracts the insects. Unlike termites, carpenter ants do not eat wood. They nest in it. Carpenter ants get their name because they dig through wood for their colonies and turn wood planks into piles of sawdust called frass. If you find strange, small piles of sawdust in your garage, that typically means you have a carpenter ant infestation. The longer these are left untreated, the more damage is done to your home. Carpenter ant colonies grow quickly, as they use the garage’s wooden frame to build new nests and tunnels. Termites, which cause $5 billion in property damage each year, can create even bigger problems. Termites can live either above ground or subterranean, but both types take years to show infestation. While carpenter ants are typically spotted scurrying around your garage, termites stay hidden. However, there are warning signs to look out for (especially from May through August) that will reveal if you have a termite problem. The first sign is knocking on your wood. If it produces any hollow sounds, that may mean parts of your garage frame have been eaten away by termites or carpenter ants. If your wood framing looks a bit distorted in any way, that may also be a sign on an infestation. Additionally, go around the outside of your garage looking for mud tubes. These are created by subterranean termites to provide moisture while they look for food. The last thing to look out for is piles of frass, or sawdust, near the wood in your garage. If you have determined that you may have an infestation, call an exterminator immediately. You will definitely want a professional to handle the removal of these pests and track the damage they have caused. Additionally, you will want to take preventative measures to prevent further infestations. 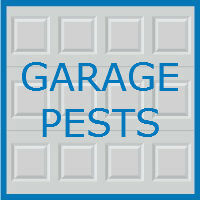 Pests often find their way into the garage if the bottom of a garage door is not properly sealed. Contact Blue Sky Builders online or at (630) 852-8485 if you think your garage door needs an update.